Hot flashes after age 60 are the most common and troublesome symptom of postmenopause. 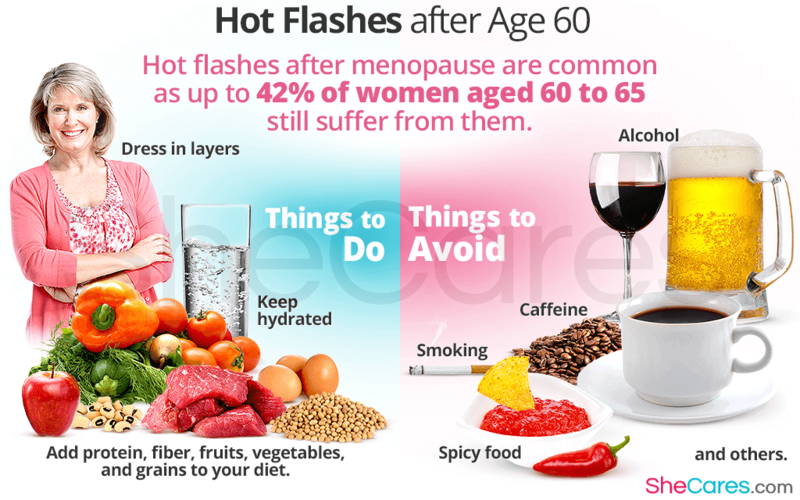 If you haven't been informed about hot flashes after age 60, a sudden severe episode can be frightening; so please take your time to read the information on hot flashes after age 60 below. What Are Hot Flashes after Age 60? Hot flashes are a sensation of intense heat in the upper part of the body, accompanied by sudden rapid heartbeat, a rising flushing of the chest, neck, and face and is often followed by heavy sweating. The duration of hot flashes varies between thirty seconds and five minutes. Intensity and frequency of hot flashes after age 60 varies greatly from woman to woman, but it is believed that as faster a woman goes through the transition from regular menstrual periods to no periods, the more significant her hot flashes will be. Within three years before menopause, one out of two women has hot flashes and about 75% of women have hot flashes after menopause. Medical researchers were surprised at where women felt their hot flashes. Over half of the flashes started in the neck, head, scalp, and ears; 28% began in the neck or breasts; 24% below the breasts; 48% all over. Not all of these women experienced flashes consistently in the same areas. With regard to intensity, 48% hot flash symptoms were rated as mild, 39% as moderate, and 13% as severe. Mild means that a flash was barely noticeable, was quick, and didn't interfere with anything. Moderate means that it was warmer, noticeable (with obvious perspiration in certain areas), and longer lasting; often the women tried to end it by taking some clothes off. Severe means that a flash was intensely hot and caused the woman to stop what she was doing immediately, remove as much clothing as she possibly could, and seek a way of cooling down. What Causes Hot Flashes after Age 60? No one knows exactly what causes hot flashes, but the main purpose is probably an increased heat in the heat regulatory area of the brain due to hormonal imbalance. Decreased levels of estrogen hormones during postmenopause are responsible for a malfunction of this heat regulatory area, which detects an increased body temperature and releases chemicals that cause blood vessels to dilate so the heat can be released; in this way, starting hot flashes, but they can also be triggered by spicy food, hot drinks, alcoholic drinks, stress, hot weather, tobacco, among others. Hot flash symptoms or other vasomotor symptoms such as dizziness and heart palpitations (i, e; the term vasomotor describes bodily changes related to the constriction and dilation of blood vessels) decrease in strength and frequency after menopause, but some women may experience them for the rest of their life. 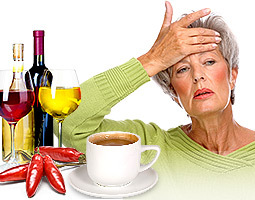 What to Do about Hot Flashes after Age 60? The best way to beat a hot flash is naturally. Hot flashes have a lot to do with the decreased estrogen levels in a woman's body, but other factors can also cause the body temperature control to go out of whack. Avoiding things that trigger hot flashes can significantly lower the intensity as well as the frequency of hot flashes women experience during postmenopause. Trying to avoid the triggers above, also wearing clothes made of natural materials (i.e. cotton) and practicing deep, slow abdominal breathing can produce a 50% decrease in hot flash frequency. Exercising regularly (i, e; walk, swim, dance o ride) can also reduce hot flashes after age 60 and have a positive impact on almost every other symptom attributed to postmenopause. Since hot flashes after age 60 have been related to decreased estrogen levels, the pharmaceutical companies would make women believe that the treatment for hot flashes after age 60 is medication. Although, hormone replacement therapy (HRT) has been used to alleviate symptoms of postmenopause, many women consider less risky approaches like natural treatments, since ovarian and breast cancer as well as heart disease, blood clots, and stroke risks are associated with HRT. Nowadays, most women think that dealing with hot flashes after age 60 is best accomplished via a combination of healthy lifestyle and natural treatment. Also, we should always keep in mind that the most common cause of hot flashes is hormonal fluctuations. Which Are the Best Ways to Cope with Hot Flashes after Age 60? Three levels of approaches can be considered for treating Hot Flashes after age 60: (1)lifestyle changes, (2)alternative approaches and (3)drugs and surgery. The safest way is to start with the least risky approach and go on to the next level only if it is necessary. Click on treatments for hot flashes and don't miss these three excellent approaches.